The largest toy in the exhibition features nearly 80 pairs of animals. 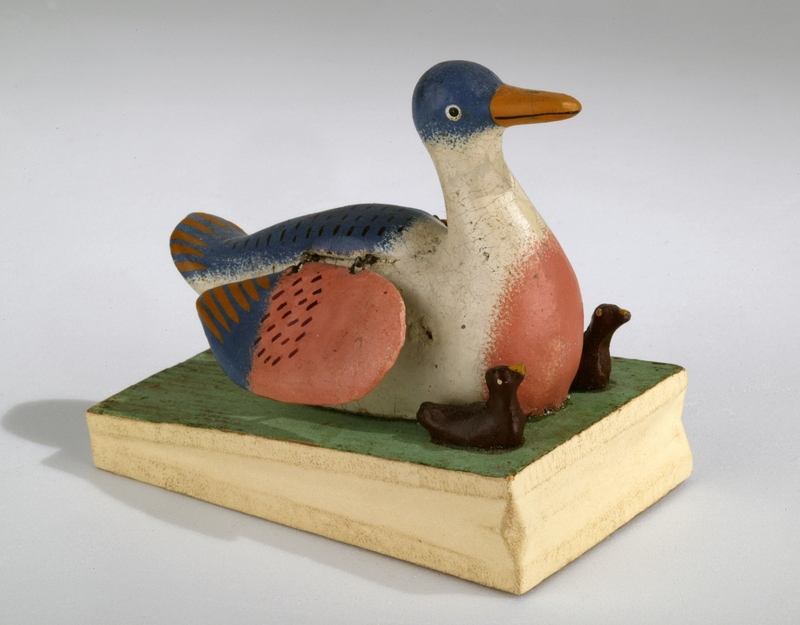 Ark toys were particularly popular between 1840 and 1900. Noah’s Ark, Germany, 1840–80. Wood and paint. All images courtesy of the Art Museums of Colonial Williamsburg. WILLIAMSBURG, VA. – “These toys are so much a part of the history of American childhood that they cannot be ignored.” Without equivocation, Jan Gilliam, the associate curator of toys at Colonial Williamsburg, stated why the American public should care about dolls, jumping jacks, toy soldiers, Noah’s Arks, squeak toys and other German playthings imported into the United States during the Nineteenth Century. 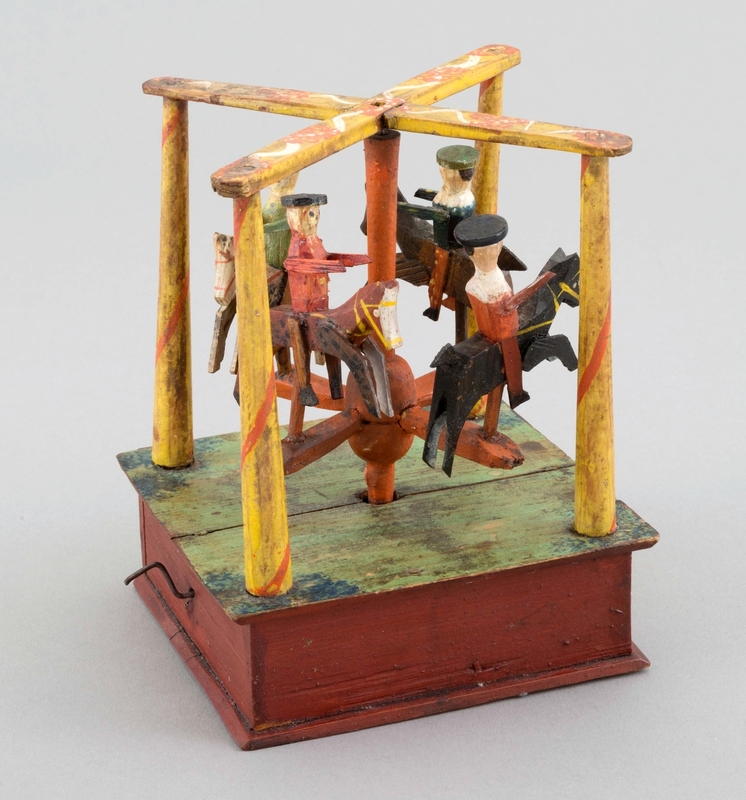 As Gilliam calls out in her exhibition “German Toys in America,” historians estimate that well over half of the toys sold in the United States during the 1800s originated in Germany. Some experts gauge the number at a startling nine out of ten. Nowadays, these delightful antiques are often misidentified as American-made, a misconception that speaks to how thoroughly these objects permeated American life. 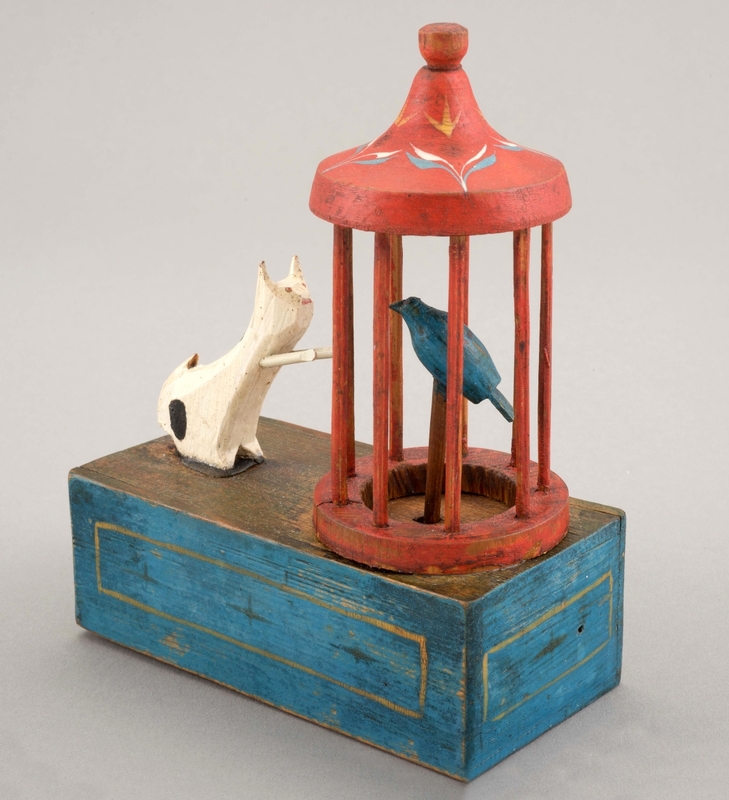 On view at the Abby Aldrich Rockefeller Folk Art Museum, one of the Art Museums of Colonial Williamsburg, this informative and appealing exhibition uses a remarkable toy sales catalog as an entry point. Gilliam has selected approximately 50 toys to represent models illustrated in it. 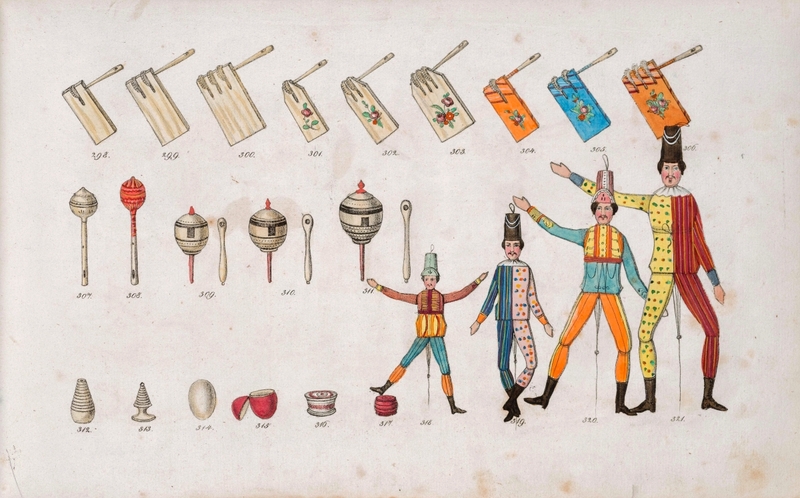 The toys date roughly from 1840 to 1900. 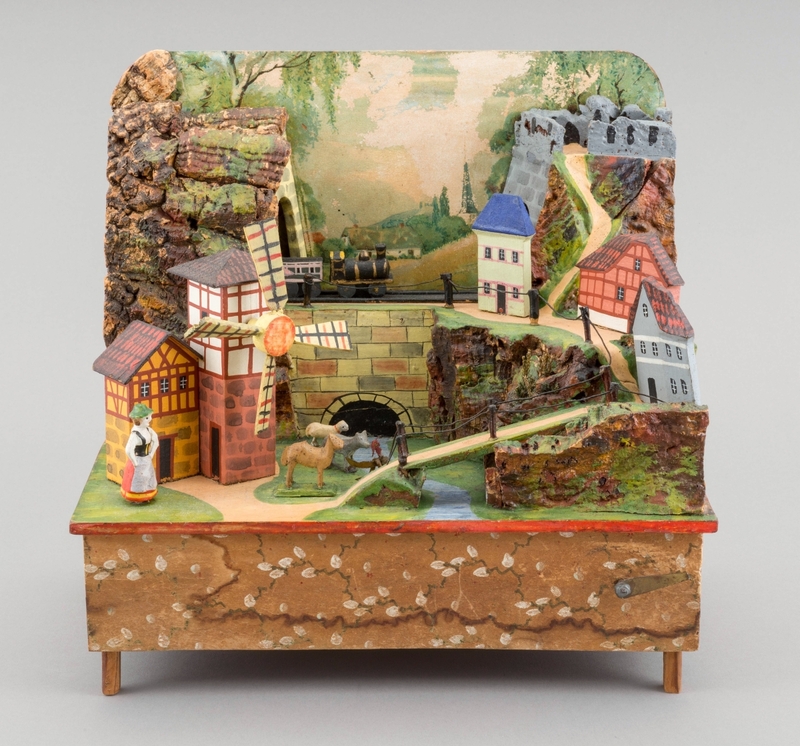 This is the first major exhibition devoted to the types of German wooden and papier maché toys sold in the United States during the Nineteenth Century. At the time, Germany was the primary source for less expensive toys consumed in Europe and in the Americas. The sales catalog and toys on view are part of the Colonial Williamsburg collection. 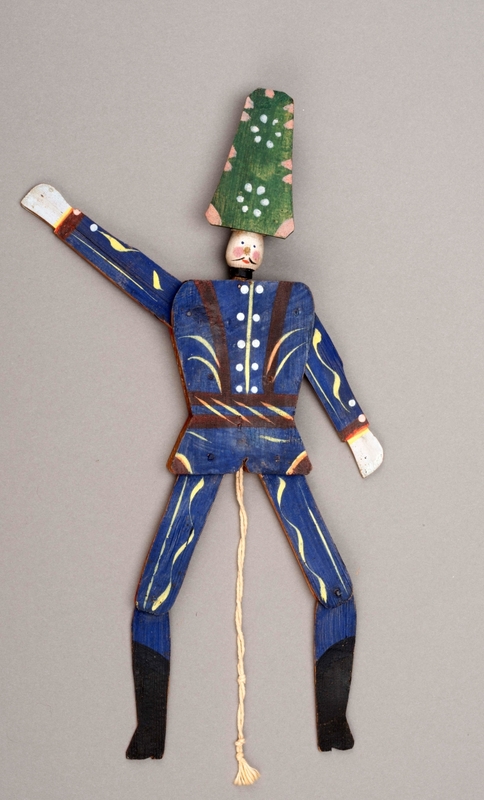 As an initial sortie into Toyland, in the 1960s staff at the Abby Aldrich Rockefeller Folk Art Collection, as it was called at the time, acquired toys for holiday-themed displays. Colonial Williamsburg later pursued a broader and more active program of collecting toys made and retailed in America from the Eighteenth to the mid-Twentieth Centuries. The Germanic regions of Thuringia and Erzgebirge and the city of Nuremberg were integrally tied to the toy industry in both former and modern times. The forested region of Thuringia is situated in present-day east central Germany and contains the town and toy center of Sonneberg within its borders. The Erzgebirge (Ore Mountains area), also heavily wooded and located in the east, borders the Czech Republic. 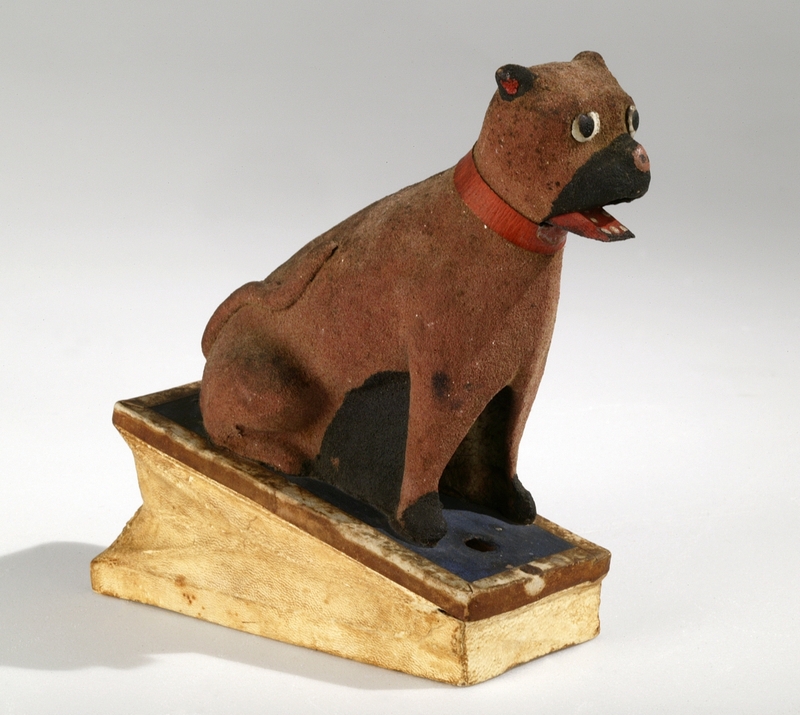 Here miners traditionally fashioned toys during their off-hours and the state even founded a toy production school in 1857. During the Nineteenth Century, Nuremberg served as an international retailing headquarters. The city currently hosts Spielwarenmesse, the largest annual toy trade fair in the world. Back in the day, toy production was a cottage industry minus the charm of Santa’s workshop. 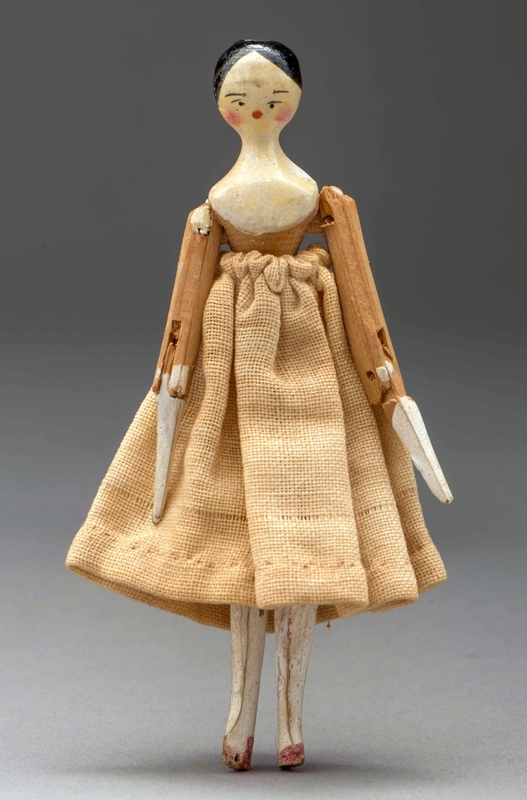 Families in Thuringia and Erzgebirge churned out wooden toys, producing thousands of a very limited number of forms. Gilliam quoted from an 1889 newspaper story, which revealed the narrow focus of these toy makers and the tedium inherent in their labors. “One person will make one or two things, and work at these all his life. One woman cut just six animals out of wood – a cat, dog, wolf, sheep, goat and elephant…. One family will spend a lifetime painting gray horses with black spots, and another paints red horses with white spots.” Agents traveled through the countryside, gathering up these domestically produced items and transporting them to distributors’ warehouses. While this specific catalog was aimed at the Italian market, the Lindners also sold toys in the United States and thus it is relevant to the “German Toys in America” story. 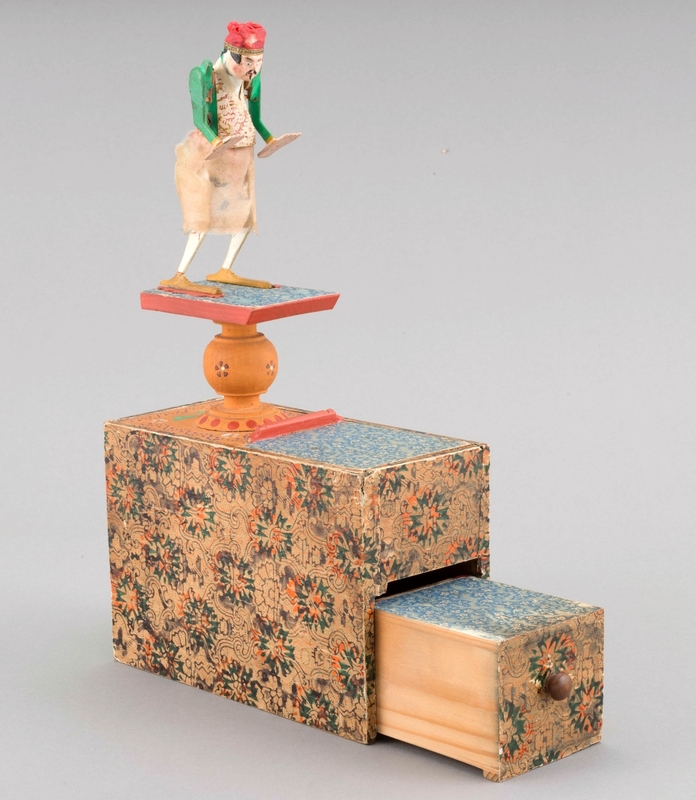 Graphic details from the catalog’s hand colored engravings are juxtaposed with the toy models shown. The original catalog is displayed to reveal two of its large-format pages. Museumgoers are able to “flip through” a digital version of the volume. When the crank is turned, the horses rise and fall and a spiked rod inside the base plucks a wire to create a clip-clop sound. 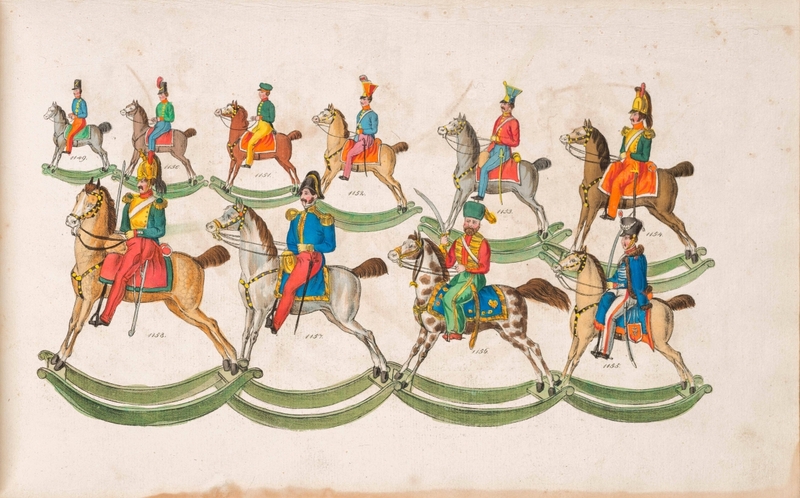 Galloping soldiers, Germany, 1840–80. Wood, paint and paper. Asked about favorites, Gilliam pointed to toy soldiers, noting that while some were wooden, those made of press-molded papier maché often possessed more detail. 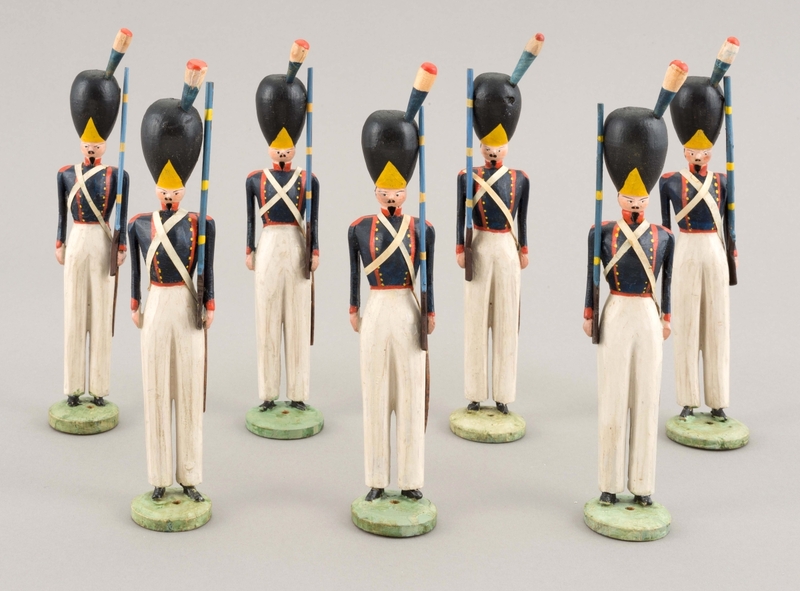 Toy soldiers were painted in various uniforms and were aimed at different price points. 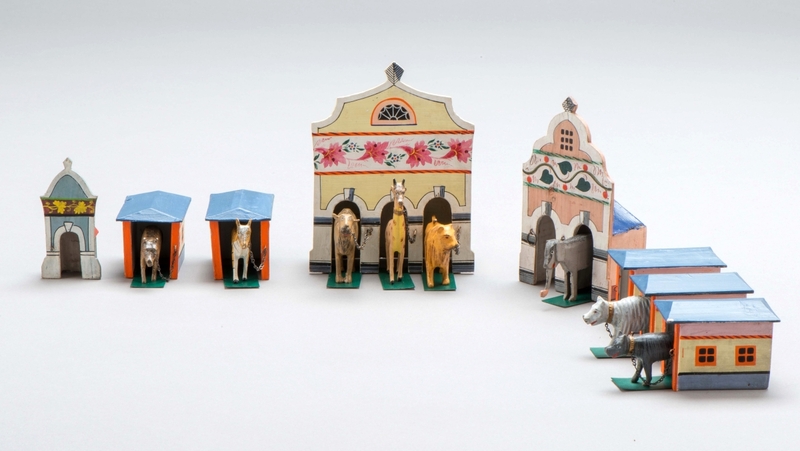 Gilliam also selected the Menagerie, a set of little buildings each housing one or more exotic animals. It taught children about nonnative species before zoos were commonplace. While elephants, lions and other exotic creatures had been depicted in juvenile book illustrations and exhibited individually in America by the early Nineteenth Century, the first American zoo, located in Philadelphia, did not open until 1874. 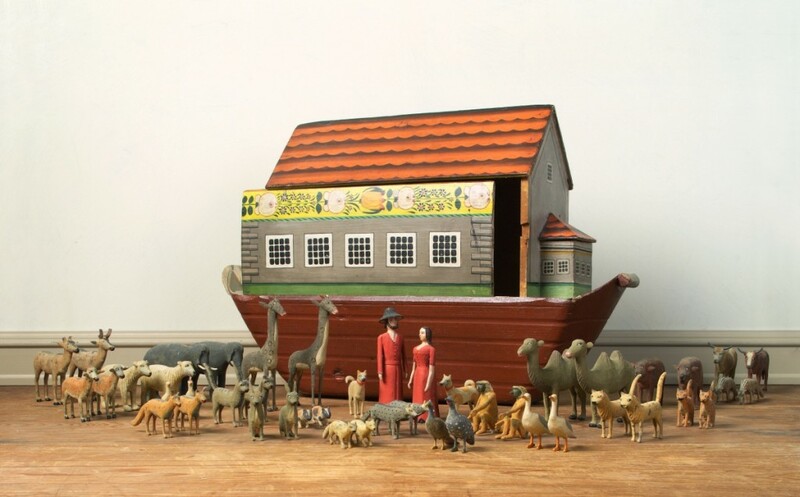 In Gilliam’s estimation, this happenstance “makes a toy like the Menagerie or Noah’s Ark have more meaning.” As evidenced in period toy catalogs and newspaper accounts, Noah’s Ark was a toy retailed over a half-century. Tradition has it that this toy, with its obvious relationship to the Old Testament story of the Flood, was a Sunday plaything. Much of the toy’s charm lies in the figures representing the male and female beasts and birds Noah brought onboard his boat. 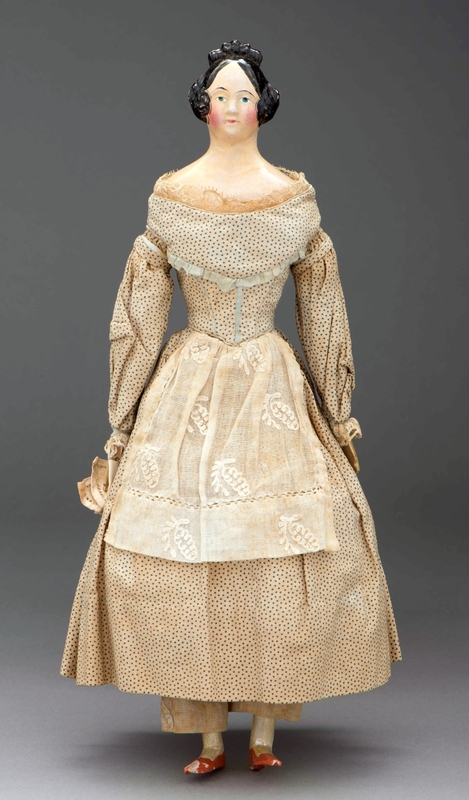 Craftspeople typically used a combination of turning, carving, gluing and painting to fashion the figures. Makers exploited the technique of ring turning on a lathe, or reifendrehen in German, to kick start the process. Using chisels, a turner gave a ring a specific contour. Once sliced, the ring revealed the profile of an animal. Further splitting of the ring resulted in dozens of these profiles. Makers then refined these roughed-out generic creatures through carving and sanding. They added tails, antlers, trunks and other appendages as required, then decorated the figures with paint. This zoolike play set was available in the United States before the establishment of the nation’s first full-fledged zoo in 1874. Menagerie, Germany, 1840–80. Wood, paint, metal and paper. 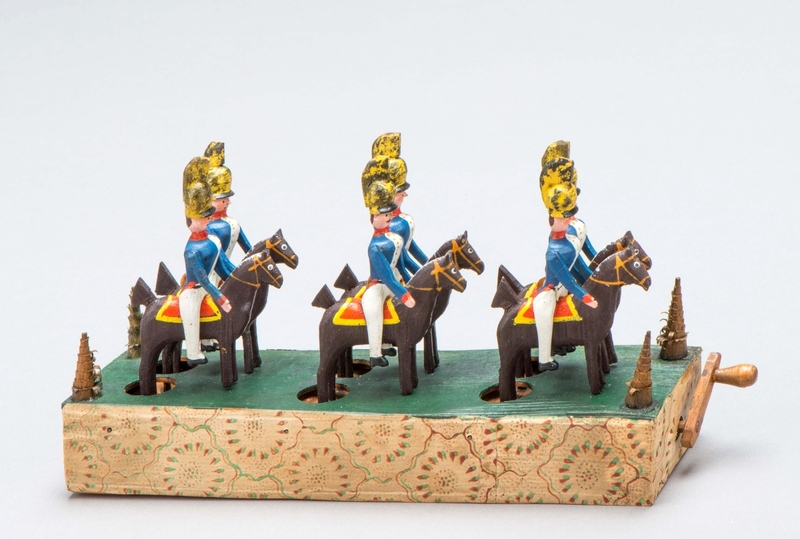 For those interested in learning more about these toys, Gilliam recommends Early Toys From Thuringia and Erzgebirge by Maria Leipold, Dieter Leipold and Susan Bickert. Published in 2012, the book is written in English and German. 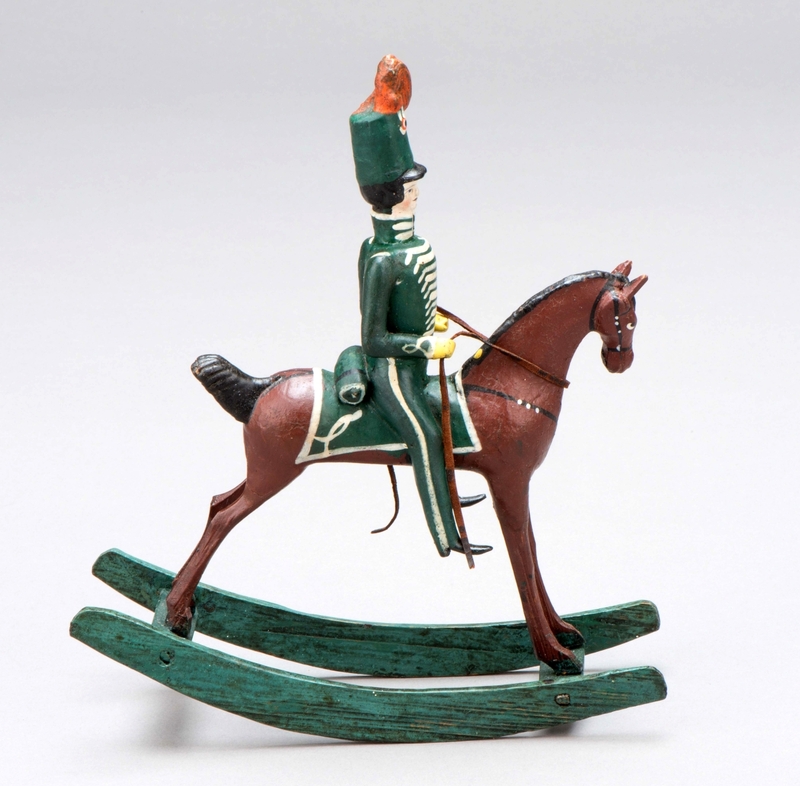 “German Toys in America” remains on view at the Abby Aldrich Rockefeller Folk Art Museum through August 2018. For additional information, www.history.org or 757-229-1000. The mama bird’s wings are wired. When the bellow is pushed, her wings flap and she squeaks. 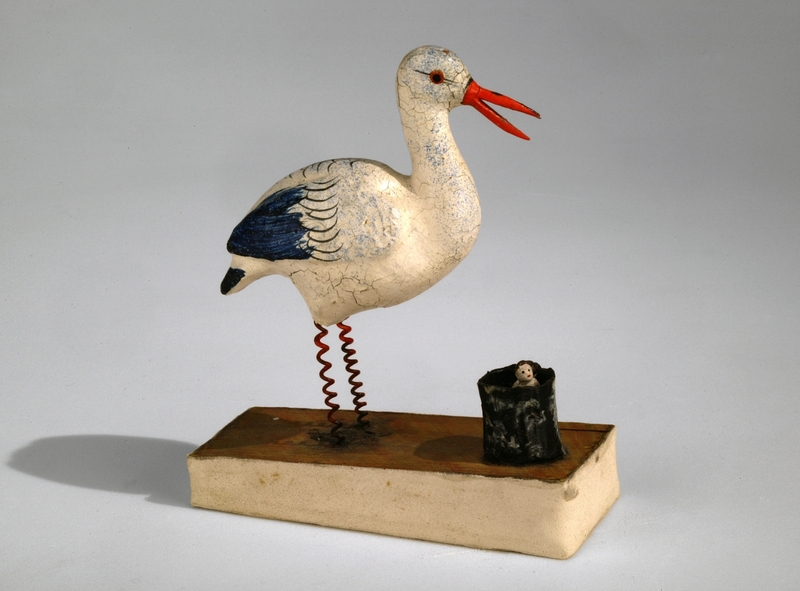 Swan squeak toy, Germany, 1840–80. Papier maché, wood, leather, paint and wire.